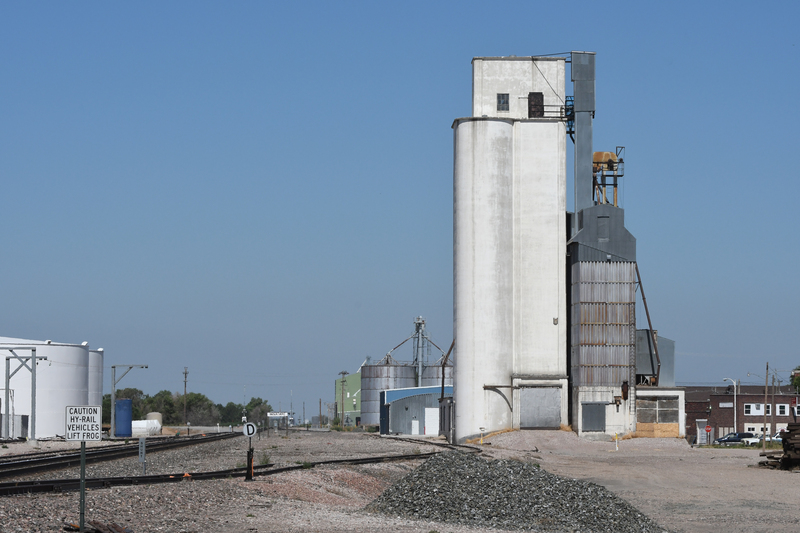 The small concrete elevator in Minatare, Nebr., is the oldest we have visited that was built by Tillotson Construction. 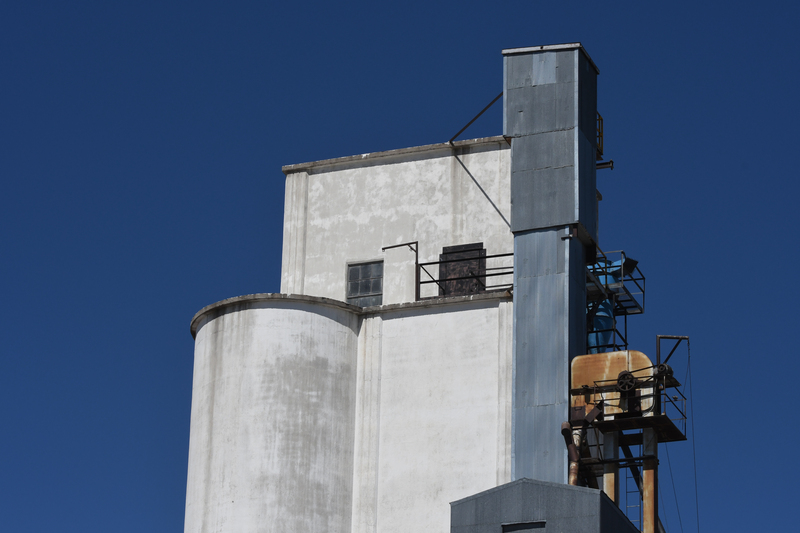 After forming in 1938 as a partnership between Reginald and Joe Tillotson, and with their sister Mary also involved, Tillotson Construction built their first concrete elevator in 1939 and another in 1940. Both were in Oklahoma. But 1941 was a big year with five elevators, a pair of which, also in Oklahoma, were quite large with capacity of 212,000 bushels. 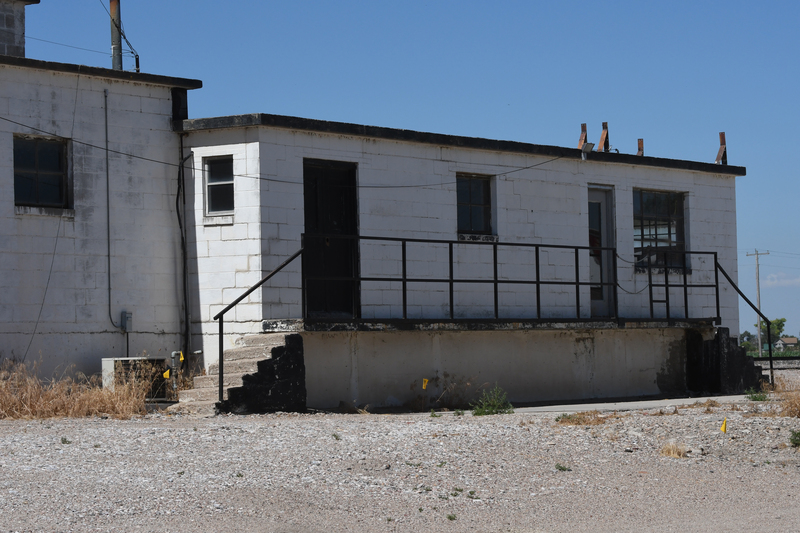 The Minatare elevator in this town in eastern Scotts Bluff County was built according to a plan original to the site. Company records show it had a side driveway with bins over the drive, 11 bins, two tanks with capacity of 16,000 bushels and two with capacity of 15,300 bushels. The elevator and dryer stand idly by the Minatare rail siding. Construction details show 690 cubic yards of reinforced concrete were used and 27.5 tons of reinforcing steel. Gross weight when loaded was 3,377 tons. The drawform walls rose 100 feet, and the cupola’s dimensions were 15 feet wide, 28 feet long, and 18 feet high. The center of the head pulley was at 116.16 feet above the ground. This was a single-leg elevator. The head pulley was 48 x 14 x 3 7/16 inches, which was an inch and a quarter wider than the boot pulley. A 15-horse Ehrsam motor turned the head at 48 rpm. Leg capacity isn’t listed. What is listed, though–and we find this quite exciting!–is information about costs that the company records exclude after World War Two. Double-checking the numbers, we find the total of 19,578.22. That’s 18 cents higher than the amount stated in the records. The co-op office attached to the elevator. Grain weight and quality were assessed here. What we would like to learn next is how Tillotson Construction landed those early jobs like Minatare. And how much was the commission? We have the sense there are more records available at the locations to help us learn about our grandfathers’ grain elevators. One of these days, we want to visit Goltry, Newkirk, Douglas, and Medford, Okla., just for starters, to learn what we can about those early days. This entry was posted in Their Work, Tillotson Construction Company and tagged agriculture, architecture, construction, history, Nebraska, photography. Do you ever look at newspaper archives to see what might have been published?